Dell OptiPlex SFF Desktop PC. We have installed a new hard drive. We have thoroughly cleaned and tested this system. this is a great machine. - HP DC7900 Tower. - Core 2 Duo 2.66GHz CPU ( CPU ). - Desktop Case. - 3 gig ram. and simply hook up your monitor, keyboard, and mouse. Windows XP Pro Coa sticker is attached at top of each machine. Each machine has been tested, with a master test drive. They are fully functional. you can see from the pictures, these machines are in great condition also. We have installed a new hard drive We installed NEW windows XP PRO, with Proper Keycode ( keycode sticker is still attached to top of unit ). We have thoroughly cleaned and tested this system. - Dell optiplex GX270 / GX260. 1TB SATA Hard Drive. (excluding Windows XP and older), due to Microsoft licensing we are not able to do the upgrade for you. Dell Optiplex. 17” Dell Monitor (Style may Vary). HD Integrated Audio. Genuine Microsoft Windows software preinstalled. 500GB HDD with Windows 10 Pro installed. Core 2 Quad Q8400 @ 2.66 GHz. Computer has been refurbished to fully working condition. See pictures for more details. PC may show signs of prior use such as scratches and/or blemishes. Computers in good working order. Power cord included. No accessories or peripherals. minimum 80GB SATA Hard Drive. Optical DVD/CD Drive. 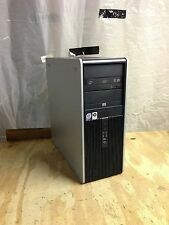 Dell Desktop Computer Dual Core 3.2GHz 4GB 1TB Windows XP Pro WIFI Configurable! We have installed a new hard drive We installed NEW windows XP PRO, with Proper Keycode ( keycode sticker is still attached to top of unit ). We have thoroughly cleaned and tested this system. this is a great machine. 2 gig ram. 160 gig Hard drive. We have loaded a new install of windows xp pro software. This unit has a DVI and VGA hook up on the back side. You can see from the pictures, these machines are in great condition also. HP Gateway E - 6610D Tower. We have installed windows xp Pro. We have cleaned and tested this system. this is a great machine. - Desktop Case. and simply hook up your monitor, keyboard, and mouse. Model: Dell Optiplex 360. Storage: 160GB. We strive to provide the best computers at the best prices. Video out: VGA. We have installed a new hard drive. We installed NEW windows xp pro edition, with Proper Keycode ( keycode sticker is still attached to top of unit ). We have thoroughly cleaned and tested this system. PC may show signs of prior use such as scratches and/or blemishes. Computers in good working order. No accessories or peripherals. NO HARD DRIVE. Optical DVD/CD Drive. Audio/Mic/Input in back and front. Model: Dell Optiplex 380. The computers in this lot have been tested, inspected and reloaded with Windows XP. No keyboard or mouse is included. We strive to provide the best computers at the best prices. There maybe scratches, small nicks, dings, or other case imperfections. Dell Optiplex 780 Small Form Factor for sale. Windows XP Professional x32 bit. This is a complete Desktop computer with a 19" AOC display, keyboad, wireless mouse and wireless USB adapter. The computer specs are 250GB Hard Drive. It is to the best of my knowledge operational. 500gb hard drive (upgraded). RS 232 port. Refurbished Gateway computer. WiFi adapter. We installed NEW windows xp PRO, with Keycode ( keycode sticker is attached to top of unit ). We have thoroughly cleaned and tested this system. this is a great machine. - Dell optiplex 960 MT. - 250 HDD Sata. We have installed a new hard drive We installed NEW windows XP PRO, with Proper Keycode ( keycode sticker is still attached to top of unit ). We have thoroughly cleaned and tested this system. We provide the windows XP PRO software installed on the machine, with the sale of the machine. May have signs of wear and use. Drivers are installed. Just plug in and use, computer is ready to go. 40GB Hard Drive. - IBM BKU-8104 Desktop. This desktop is in fully functional condition. - Windows XP Pro 32 Bit. We have installed a new hard drive. We have thoroughly cleaned and tested this system. this is a great machine. - HP DC5800 Tower. - Desktop Case. We provide the windows software installed on the machine, with the sale of the machine. I held on to it because I really love this unit. I would run XP forever if I could, but progress doesn't stop and it is no longer practical for my purposes. I supplied my own keyboard and screen because I had limited room. We have installed a new hard drive We installed NEW windows XP PRO, with Proper Keycode ( keycode sticker is still attached to top of unit ). We have thoroughly cleaned and tested this system. - Dell optiplex GX280 SFF. Hard Drive 1TB SATA III 7200RPM. Heatsink & Fan 775 CPU cooling Fan w/ Copper Base. (Dual Display). OS Windows XP Pro 32 Bit. NETWORK DEVICE Onboard network interface Gigabit LAN connectivity. Gigabit LAN is ideally for seamless internet connection such as streaming audio and video contents. · Ethernet : (1) Gigabit Ethernet Port. · Storage : 500 GB HDD 5900 RPM. · Software : Genuine Windows XP. I Start With thoroughly deleting confidential data. We currently use Darik’s Boot and Nuke (DBAN ). 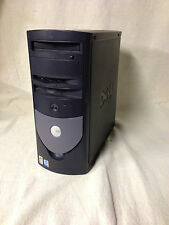 For sale is a Dell Optiplex 210L running Windows XP Professional SP3. Dell monitor and power cord are not included. The specs are as follows Dell Optiplex 210L. Windows XP Professional SP3. CPU: Pentium 4 @ 3.4GHz. HDD Hard Drive: New 750GB SATA. DVD Optical Drive: New DVD±RW DVD & CD Burner/Player Drive. Featured DELL Optiplex 755/760 Desktop Technical Specifications Keyboard/Mouse: Dell Keyboard and Dell Optical Mouse. This machine has been fully tested, and is pre-loaded with a clean install Windows XP Professional SP3. This system will be ready to go out of the box! DVD /-RW Drive. Windows XP Professional SP3. Otherwise, the system is overall in good condition. Windows XP sp3. 1TB HARD DRIVE. Tower Desktop. Dell Optiplex. Genuine Microsoft Windows software preinstalled. ESET Antivirus included with all Windows installed. An item that has been used previously. We have installed a new hard drive We installed NEW windows XP PRO edition, with Proper Keycode ( keycode sticker is still attached to top of unit ). We have thoroughly cleaned and tested this system. Microsoft no longer provides security and other updates for XP. Most people buy Windows XP computers to run their old software that only works on Windows XP. This should not replace your primary computer. 500GB Hard Drive. 500GB SATA Hard Drive. Windows XP PRO Monitor. FAST Dell Optiplex. Dell Optiplex. Genuine Microsoft Windows software preinstalled. 17” Dell Monitor (Style may Vary). HD Integrated Audio. HDD Hard Drive: New 300GB SATA. DVD Optical Drive: New DVD±RW DVD & CD Burner/Player Drive. Featured DELL Optiplex 755/760 Desktop Technical Specifications Monitor: Monitor Not Included. Audio Ports: 3 Line-in Line-out & Microphone Ports in the Back 1 Headphone in the Front. Desktop Windows Xp Pro Sp3. Window Xp Pro Sp3. Fast Dell OptiPlex 780. 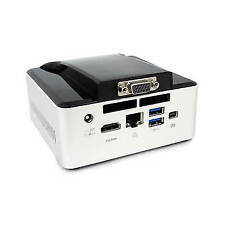 SFF PC DESKTOP COMPUTER. OptiPlex 780SFF PC DESKTOP COMPUTER Network Card Dell Primary Drive or Optical Drive Warranty covers hardware issues only and excludes problems caused by abuse or tampering with components. HDD Hard Drive: New 500GB SATA. DVD Optical Drive: New DVD±RW DVD & CD Burner/Player Drive. Featured DELL Optiplex 755/760 Desktop Technical Specifications Keyboard/Mouse: Dell Keyboard and Dell Optical Mouse. Power cord included. HWmonitor Temperature monitor. We have installed a new hard drive We installed NEW windows XP PRO, with Proper Keycode ( keycode sticker is still attached to top of unit ). We have thoroughly cleaned and tested this system. - Dell optiplex GX280. HDD Hard Drive: New 250GB SATA. DVD Optical Drive: New DVD±RW DVD & CD Burner/Player Drive. WiFi Wireless Featured DELL Optiplex 755/760 Desktop Technical Specifications Keyboard/Mouse: Dell Keyboard and Dell Optical Mouse. Are you looking for a reliable desktop operating system that will not break the bank? If so, you will be happy to know that eBay has just the right Windows XP desktop for you. You can choose from a large selection on eBay's user-friendly website, and here is what you need to know before you make a final decision. Is the Windows XP desktop available in different versions? You will be able to choose from Windows XP with Service Pack 3, Windows XP Professional 32 bit, and Windows XP Professional 64 bit. Each of these operating systems may be offered under various licensing options. The following list summarizes the characteristics of each operating system. Windows XP: Might have Microsoft Works rather than Microsoft Office; support for Windows Media Player, Messenger, and Internet Explorer; supports internet connection sharing and peer-to-peer networking. Windows XP Professional 32 bit: Contains Microsoft Office; backwards compatible with Windows 95; support for Remote Desktop, Windows Media Center, DirectX graphics, and workstation mode. Windows XP Professional 64 bit: Enhanced capacity to use greater amounts of RAM results in better performance in media streaming and resource-intensive operations. Are there different installation and licensing options for Windows XP? Unlike more recent versions of Windows, the XP operating system was never available as a download from the Microsoft website. Installation with DVD or CD may be offered under several licensing terms, including multi-license for use on more than one computer. You might also find computers that are running the OEM version of Windows XP, most commonly on refurbished computers. This option would allow installation only on a single computer but may be possible to replace with a multi-user license if needed. What are the specifications for a Windows XP desktop? Your Windows XP desktop will be equipped with RAM that ranges from 1 GB to 2 GB and hard disk capacity between 80 GB and 1 TB. 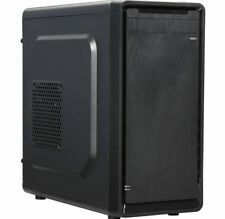 Chassis types include towers, mini-towers, micro-towers, mini-desktops, all-in-ones, and two types of slim models. Processor speeds will typically range from 2.50 GHz to 3.49 GHz. The following list summarizes the processor types that could be installed in your Windows XP computer. Pentium Family: Includes Pentium, Pentium 4, and Pentium 4 HT processors. Celeron Family: Includes several processors within this series. Duo and Quad Core Family: Includes Core Duo, Core 2 Duo, and Core 2 Quad. Core i5: Includes 2nd generation processors within this series.